The Sawatzky family has a history and a heritage that is rare these days. Grower/packer Richard Sawatzky was actually born in Canada due to some crazy circumstances. Richard’s father fought for the German’s World War II. The Americans captured him one week before the end of the War. He was put in a prison camp in Belgium it was there that he received a letter from his mother stating that he needed to come home because she was working with an organization called MCC to immigrate to Canada. Richard’s father and another prisoner devised an escape plan and began hoarding chocolates and cigarettes as bargaining tools for their escape. While imprisoned they were forced to work in the coal mines. The prisoners and the civilians wore different work attire to distinguish between the two. The hardhat was one of the distinguishing elements. Richard’s father and the other prisoner got civilian hardhat and used them to escape! They had civilian hardhats, chocolates, cigarettes, and now freedom! They walked in the forest for three days and met a farmer that agreed to help them by giving them civilian clothes. After some negotiations, the farmer agreed that he wouldn’t turn them in. Using their chocolates and cigarettes Richards dad finally made it home. They immigrated to Canada where Richard’s father was working for a farmer that grew beats. Eventually Richards’s dad married a girl that he had met in Germany in a refugee camp. They had all their kids in Canada, (this including Richard) and then moved to the United States. They owned 10 acres and farmed grapes and raised chickens. Now, Richard never had experience in tree fruit until he met his wife, Lavone. They were high school sweet hearts, and during these years Richard started working for her family. This is where the Wiebe Farms comes from; it’s her maiden name. Richard and Lavone make an amazing team and now work together on the farm she grew up on. Lavone’s grandfather, Ruben Nickel started the farm with 45 acres growing table and raisin grapes. Lavone’s father, Louis Wiebe, took over the family farm in 1952 due to some unforeseen circumstances. Lavone’s father had discussed with Ruben the plans for the summer. The very next morning, the first day of Peach harvest, Lavone’s grandfather was found in his truck. He had passed away. Lavone’s father took over the farm at this point. He was 23 years old. Four years later, in 1956 Louis planted their first block of tree fruit. They still had cotton and alfalfa, but from ’56 on they slowly planted more and more tree fruit. When Lavone was growing up, she spent lots of time working on the farm. Until she was in Junior High, her family packed all their tree fruit in the field. Field packing was very common at this time, but it was a lot of work. Lavone did field pack one summer, and soon after her family built a packinghouse. Because they were field packing in the early years, her dad was able to drive to LA every night to sell some of their fruit. It was a very tiring way of doing things, but it helped make ends meet. Richard can remember driving forklift in the Wiebe’ packinghouse and waiting for Lavone to bring him a candy bar before he took the culls out at the end of the day. Both Richard and Lavone have been so involved with the family farm that is so encouraging to see them still loving what they do, and succeeding. The year of 2010 was a very difficult one. The fruit set was very poor and there was some hail in the spring that damaged the crop. In 2011, the Sawatzky’s became to sole owners of the family business; they had been partners with Lavone’s brother. This transition brought new trials and opportunities. They know that all these circumstances were part of God’s design and they were thankful that He brought them through the trials of those two seasons. 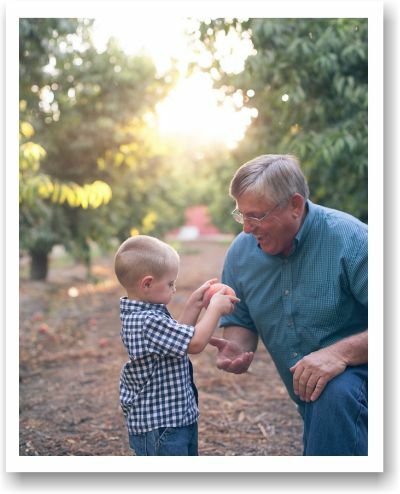 Today Richard and his son Ryan, who is the 5th generation carrying on the family business, farm about 550 acres. Ryan is a huge asset to the business as he is an operations manager and problem solver. His full intent is to continue this legacy of farming delicious Summeripe fruit. Richard’s favorite fruit is a peach and you’re most likely to see him eating a July Flame or Zee Lady. Farming, like any business is challenging. The benefits far outweigh the challenges. He loves sharing his passion for growing the best fruit with others. He loves the challenge of being able to grow and provide the consumer with the best tasting fruit possible. Richard loves farming because it has given him the freedom to be involved in so many different things. He loves that he could be there for his kids’ events, and now it’s the same for his grandkids. Summers are lots of work, but there is always a light at the end of tunnel, and you know at the end of the summer, there will be down time. Richard just plain loves farming. You can sense it immediately when he talks about growing the best fruit possible. 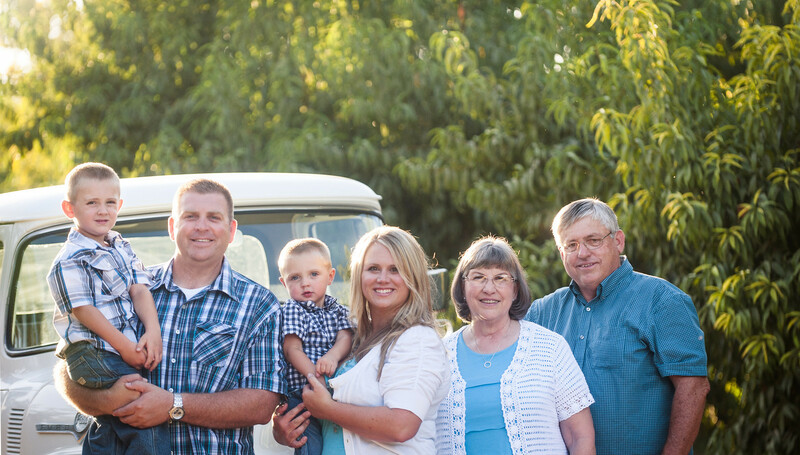 He’s so proud of his family history in the Ag Industry, and his contributions to Summeripe. He hopes you enjoy eating his fruit as much as he enjoys growing it. View & Download high-res photos of the Sawatzky Family for use in sales materials, social media and print. Download the entire packet with everything you need to create a "We know the Grower" Campaign. Includes 3 versions of the Grower Bio, photos and more.